Up to now I've basically been using twitter as a "that's interesting" service. The only problem has been that I've not been as systematic as I should be about recording the url's of things that I wanted to refer back to. As part of my drive to become more efficient I'm going to start using delicious to bookmark the url's of blog posts or web articles I think I'll want to refer back to - and these will mostly be more technical material. I've set my delicious feed to repost these to twitter, a bit like I do with my tumblr feed for notes and comments. News reports and so on that I think interesting that day will still go direct to twitter. but no mention of using a UMich id to authenticate. Now allowing non UMich people to authenticate to comment is a good idea, but I would have though the'd have shoe horned in Shibboleth or something like that to allow people at other institutions to comment using their institutional credentials. But no, nothing like that. So the question is accident or design - do they reckon facebook and twitter so pervasive they unconsciously expect everyone to have an account? Interesting post in today's New York Times about how psychology research has been influenced by choice of human subjects and their cultural baggage, in the most part US university undergraduates. This has been a dirty secret inside psychology for quite some time - for example in my former field, psychophysiology, a lot of the data comes from either relatively non-stressful studies on undergraduates, or US marines - the marines getting in on the act because soldiers can be ordered to do a puzzle solving task while standing stark naked in a commercial meat freezer with a thermocouple up their backsides - that particular experiment was to correlate lowering of body core temperature with problem solving ability - something that might be useful to know if you ever planned to fight a ground war in Siberia. But these cultural models are a trap - the Evenk, or any other cold weather peoples have probably evolved a set of cultural rules to cope with the problems of cognitive degradation. The study of human interaction is littered with such misunderstandings - for example one thing that used to puzzle clinical psychologists was the different outcomes when the disturbed and mad are released into the community. In some cultures they do quite well as people feel a family and neighbourhood responsibility for crazy uncle Abdul, and as long as he doesn't do something unacceptable people will look after him, ensure he has something to eat, changes his clothes etc. In a lot of Anglo cultures crazy uncle Abdul is given a housing commission flat miles away from anyone he knows, a bag of tranquilizers he doesn't take cause he feels funny, and is left to wander the streets where he rapidly becomes a smelly derro, and that happens due to sociological and cultural differences between Morocco and London, or Parma and Seattle. Mediterranean cultures see looking after the mad as a social and family responsibility, Anglo a responsibility of society in general. Now let's turn to the study of history as sociology or anthropology, ie understanding how these societies worked. In fact let's take the Romans in the first century CE. Because they wrote a lot of material that is culturally significant to our society we tend to view them as if they were Oxford dons with a tendency for toga parties, sexual licentiousness, and violent blood sports. (Blame Robert Graves for this model). Actually their society wasn't like this at all. Rather than 1930's Oxford it was possibly more like 1980's Egypt or Morocco - women were cloistered but had property an business rights, men were expected to strut their stuff, and there was a lot of decadent behaviours behind closed doors. (I once went to a night club in Konya in Turkey - it made the York version look very very tame, but outside everyone was properly Islamic and frowned on alcohol etc etc, and the peasants in the market would probably have seriously disapproved of what went on in the Star Club). As such not only do we form an imperfect view of their society due to gaps in the written record, but our interpretation is unconsciously flawed due to our own stereotypes. We deplore gladiatorial contests becuase they are at variance with our view. For much the same reasons we also deplore bullfights. A professor of literature at Malaga university might acknowledge the cruelty, yet enjoy the experience. Who would have the better understanding ? As I've commented before, I use wikidot as my commonplace book for hosting online notes. I used to use wetpaint, but moved to wikidot because of its less intrusive advertising. One nice feature they have is 'other interesting sites', which they add as banner below (can banners be below) to the bottom of pages displayed from free accounts. And one thing that strikes me is just how many academic wikis there are - be they an applied mathematics page from a university in Portugal, a Brazilian project to collect material on south American languages or a project to document Tibetan monasteries. So my question is, to what extent are we seeing research projects being hosted on wikidot rather than having projects install and run their own wiki server, and as a supplemental, given the increasing need to capture the scholarly outputs of institutions for reporting purposes, does this represent material that has sneaked under the wire? No, it's not bad, ctrl-c and ctrl-v have been my friends since the eighties, when, annoyed at the slow performance of a vax terminal session on a 9600 baud dialup link I used to write reports in an editor on my 9" mac classic, and then cut and paste them into a VMS editor session in a terminal window - the Vax used to think I was typing really fast and started visibly buffering the text. No, it's not bad, it's how I use kwrite. It's the Martini aspect of google docs I like - the any place any where aspect, so I can start on a document one place and work on it somewhere else, even on a rented machine in an internet cafe in Vientiane should I so choose, or more realistically and less exotically start on something at home and finish it off over mouthfuls of sushi on my desk at lunchtime. Most of my posts are fairly short, and written quickly with a minimum of editing - as you can see from the frequent typos and occasional disjointed paragraphs. But sometimes even I want to create and publish a longer post, something that needs more than the fsck-like default blogger editor. In the days when god was a boy and I had a linux machine on the desktop I used to use kwrite, nowadays I tend to use Windows live writer, which isn't quite so awesome an editor but still pretty good with nice push to publish and image import features. However sometimes you want to work on a post over a day or so. And for that I've used google docs, after all if you've got a (recent) browser you can access docs, from whatever machine you're on, be it a machine at work, in an internet cafe in Thailand, on the oookygo, or from a machine at home, and you don't need to worry about format compatilities or not having a suitable editor on the machine you're using (I'm always surprised how many people don't have a decent text editor installed these days - instead they rely on word for just about everything). Anyway I'm ranting and becoming unfocused in the process. My point is that because of it's pervasive qualities being able to use Google docs as an offline blog editor was really useful. And so, when I wrote a draft of a post on my other blog I was discomfited to discover that they'd removed the direct post to blog feature. In fact I was seriously irritated, given that blog posts are a major way to communicate and I use google docs a lot for writing both professionally and personally. Googling shows that this feature seems to have disappeared around the end of July, which explains my not noticing it as I was working fairly intensively on something else and only writing posts at the weekends on live writer. Let's just say the publish to blog feature was damn' useful, and I'd like it back. Please. Interesting post in the Time Higher ED about how university staff members are increasingly turning to web agencies to produce personal web sites, like those done for authors, journalists and the like outside of the official university profile page. The article argues that this, in part, is a response to the increasing control exercised by universities' marketing and communication departments to ensure that web pages are all in the official style and have the officially approved content. That way we would ensure that everyone has at least one web page, which is probably a good thing, but that this one size fits all approach may not work. One idea might be to be like blogger, and provide default content and allow people to add from a range of gadgets to personalise their page - perhaps add a field trip blog or twitter feed. Interestingly, this seems to be what Harvard are working towards by deploying the Open Scholar drupal framework. Clicking around the Harvard scholar website shows that they seem to be using a couple of fairly standard templates and no one (yet) has done anything that's particularly gee-whiz. Combine with some standard gadgets to pull data out of the CRIS and perhaps the LMS about courses taught might well solve things for about 90% of academics, who are probably not that fussed about fitting in with marketing's style sheets providing they can do some limited customisation on content. In short wikis act as a sort of digital common place book but one in which you can link things together and build relationships between bits of information. To explain, thirty years ago I was very interested in optimal foraging theory and group dynamics, and I had amassed a large pile of individual bits of information as notes in books and on 6x4 index cards, and I had trouble getting my head round all the facts such as seed choice size among various types of foraging desert rodents etc etc. So one afternoon I sat down with several sheets from a big drawing pad and started writing facts in little blobbettes and then drawing arrows between them. This let me work out how all the material related - basically mindmapping. Wikis let you do the same, one note or theme to a page and then you build your own set of relationships. Blogs on the other hand let you record what you did when. It would be easy to imagine using a blogging tool to write research notes in a library session, but in fact any sort of text editor would do as all you are doing is collecting information. Organizing it is something else. However, blogs are easy and there is a trend to use them as a form of reflective learning, which is fine, but it's no real substitute to learning how to do research, which is fundamentally based around synthesizing information ie organising it and structuring it to give insight - as in this example I put together a few days ago. A user wishes to teach a course using moodle and have students submit essays and gobbets (ie small text summaries on a topic) via a blog, whereby they can go into moodle, be captured and graded - and eventually archived as they form part of an (electronic) record of the students work. Of course the blog has to be authenticated so we know that it is that student logged in and the posts have to be private to reduce the risk of one student cutting and pasting another student's work. Moodle's internal blogging tool is not the best so we are looking at an external tool. The first and most obvious would be Wordpress as we (a) have a production instance running and (b) we can do LDAP authentication so we know who is writing the post. This actually starts becoming unwieldy as Wordpress has a linear stream of consciousness mode so each student would have to have a private blog per module, say one for gender studies, one for Persian, one for Middle East cultural history etc etc. And of course they would post the wrong gobbet to the wrong blog, and harvesting all the content into a single place would be a logistical nightmare. So excellent as wordpress is, the answer's no. Now if you think about what we're trying to accomplish here it's a lot like a wiki where the tutor can see everything, but individual creators can only maintain/create pages in their own tree. So - a wiki ? Well, no. Wiki's have a learning curve, and even using wysiwyg editors people need to structure their data. And the structure has got to be predictable to be able to harvest the right content at the right time. And while templates ca go a long way to imposing structure wikis do require more work on the part of the student. And of course you have to teach distance students how to use it, so it's got to be intuitive - you can't just get them in a lab for a workshop session to teach them how to do it and submit some sample work. Blogs have the advantage of linearity. You write one bit of text, then you write the second, and the second comes after the first, just as if they were diary entries written in an old fashioned paper notebook. Now Sakai has a blogging tool that's reasonably ok, uses fsckEditor, that is close enough to to default tools in blogger and wordpress, live writer and google docs that anyone who can use these tools can use to create entries with little or no additional training. Sakai also has the concept of a group blog - so the blog belongs to the gender studies 101 worksite not to jo.smith@site.edu and the students can be individual editors, and can make their posts private so they can only be seen by the tutor. And of course as Moodle and Sakai both have LDAP authentication we can (a) do single sign on (b) make sure that the person making the post is who they should be (ok has authenticated correctly). I've been quiet on the tablet and e-reader front lately. Simply because recently, and unusually, I have had little to say. Clearly we see the market segmenting into two strands - the cheap dedicated bookreader market where the devices basically have a monochrome e-ink type display and read epub and pdf format files plus a couple of proprietary ones., and the more general purpose content surfing device - the iPad. Most big bookstore chains now offer basic bookreader device, and stores like Officeworks sell various models at discount if you don't want a tie-in. Interestingly publishers don't seem to be pushing logo'd versions - yet. They're here, and while actual usage figures (as opposed to units sold) are hard to come by, you do see people using them on planes and buses. And one could see a future where they continue to occupy the low end, gonna get banged about, not going to cry (much) if it dies on me part of the market. The mp3 players of the book world. Does one thing, but does it well enough. The really cheap ones have a cable connect to host pc for download, slightly more expensive ones have a wi-fi connection, and all cost less than $200. They do what they do quite well, and certainly provide a viable way of lugging a pile of reading around. They're less good on reference works, where you want to bookmark and skip about, but hey, $200 baby! Do I regret buying one? No. I learned a lot, and even though I don't use it that much I could see myself using it a lot more if I commuted by bus rather than driving to work. Now the iPad. I'm probably the only geek in Australia who's never touched one. I did think of buying myself one but I couldn't quite bring myself to. I still have a lurking suspicion that something with a multi tasking operating system and a more open architecture might be better in the long run. In the meantime Steve and his crew have done a wonderful job in convincing the world that the iPad is a wonderful game-changing device. The iHype I'm sure will be pored over by marketeers for years as an example of how to get a vibe going. In part the iPad has succeed by being there, and unique in coming to market with a whole ecology and applications base. Alternatives like the JooJoo havn't made it, and probably are now niche players at most. And Android - well the first tablets are starting to appear, but so far there's no real momentum behind them yet - in the west anyway. And while you can get yourself a Chinese Android iPad like device such as the Apad on ebay for $150 or so, reviews and user experience is mixed to say the least. Poor build quality, poor battery life - the latter being fatal for a content delivery device given that you're probably going to sit in front of it to read for a reasonable chunk of time at each sitting. One of the things that I find interesting about the hunt for the remains of the Franklin expedition in Canada is the weight given to Inuit accounts - which seems natural they were there, and the remains of Franklin's expedition was a major source of wood and metal to them. Of course, these accounts have been known (and recorded) for well over a hundred years but were initially dismissed as fantasies by savages. I like linux. I quite like Apple, and like many people in IT I don't really like Microsoft for a whole host of reasons revolving around licensing agreements, vista, file format creep, and bloated applications - and my personal gripe - they never really got server based computing. And as a reslut when professionally and personally I could avoid using Microsoft products I didn't. In fact I found there were a whole lot of things I could do just as effectively without Microsoft products as with them. It's always been a source of fascination to me that if I search for my name or twitter handle on Bing's Australian site and Google's Australian site I get different results. not very different, just different. And sometimes Bing turns up things that Google doesn't. Not surprising given they use different algorithms. So, on the back of yesterday's post on my search for replacement bialetti gaskets I tried the search in Bing. And guess what - it produced an Australian vendor of replacement bits, even though they were slightly more expensive than ordering from the UK. So is bing finally becoming useful and a viable alternative to google? 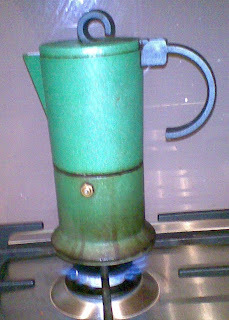 I own this rather wonderful bia 4 coffee pot from Bialetti and have done so for over 15 years - and use it every morning for my first cup of coffee of the day. I've tried stainless steel ones (scalds the coffee) and Asian copies of the orginal octagonal Gaggia's but this still makes the best coffee. Better even than the automatic machines we have at work. Like all stovetop espresso makers the gaskets harden and die, and this has been bia's problem for the last few months - you had to tighten things up really hard otherwise you'd get steam and spurts when you brewed. Poor bia really needed a new gasket. But where to start? Well, while our local DJ's still sells stovetop espresso pots they don't sell spare gaskets. Apparently no one in Australia sells spare gaskets online - yes I'm sure there's some wonderful traditional coffee shops in Sydney and Melbourne that still sell such things but they're not online. The stores in Canberra want to sell you a new (and preferably an expensive automatic) coffee maker. The first shop I turned up was in the States somewhere - really helpful website, told me how to work out which type gasket I needed (in inches mind you - ever tried finding a non-metric ruler in a metric country?) but wouldn't ship to Australia. Then I turned to ebay - and immediately found two ebay stores - both in the UK - who would ship to Australia. Eight bucks all in including shipping, with payment via paypal. Ten days for it to get to Australia and hey presto, I had a pack of manufacturer original gaskets. A bit of swearing and probing with a kebab skewer to get the old ossified gasket out and we were in business. And that's what's wonderful about the internet. Instead of trudging round stores and endless phone calls interstate I could find what I needed online, and with paypal make the payment efficiently - without being stung for minimum transaction fees. It was easy. Drawing together the twin threads of using wordpress for content management and electronic laboratory notebooks one could imagine that if one used a blog as a diary say, it would be possible to render this as epub using something like anthologize and to also make a printable version. Well people like reading diaries - for example my account of a trip J and I made to Laos at the end of 2005 has been read by quite a few people over the years and even ended up in a UN bibliography, ie people gave it some value. Now when I did it I wrote all the individual bits into kwrite and the selected and posted them into a xinha window on the blog. At the time I didn't keep the kwrite originals as I didn't think anyone but me and a couple of friends would want to read it so I ended up downloading the bits later on when it proved popular, sticking them together with open office and generating a pdf. Just so 2006! Now if one wants to review content one wants it in a convenient format - and one probably only wants a subset of the blog - after all most blogs are multi threaded and if you want something on history you don't want the ereader stuff, but split it up and put it to a set of documents - say all the blog entries tagged chile to make a diary of a trip to Chile, and if it's recreational reading you might want it on paper, in your ereader or whatever. So I guess what I'm saying is that blogging technology (and possibly wikis as well) can be used for content capture and then content republication, just as Isabella Bird wrote her account of her time in Japan as a set of letters, because that's how people communicated then. which given (a) my interest in classical history, (b) the fact I used to work in the UK and (c) given that my name turns up in the Acknowledgement sections of a couple of publications you might suspect that I had a secret double life and that I had a hand in the above translation. It's not me. I'll put my hand up for my very sparse list of publications but no more. People who work in computing in universities inevitably get involved in projects with data management issues, and most people are kind enough to acknowledge the assistance rendered, as in this marine biology example. However, as regards translations of Themistus, I have absolutely zero connection to the above or any related publication. And of course sometimes people do have past lives - as shown by the acknowledgements in this abstract. Yes folks, I really was once a research physiologist! However this does highlight an issue in trying to build retrospective social graphs based on people's research and publication record - how can you be sure that the person is who you think they are? There will inevitably be mistakes and inconsistencies, especially when working out linkages between past collaborators. The only real approach is to build your maps, and then run consistency checkers, check for outliers and then investigate the outliers. Sometimes they'll be genuine one-off collaborations, sometimes they'll be erroneous. As an approach this also solves what I term the 'Asian Researcher Problem'. Let us say we have a bright post-graduate whose name is Wong Chung Ki. He realises his western friends have problems with his name so he starts by calling himself Charles Wong, and using the initials CK Wong. After a few years he moves to a Chinese speaking university in south east Asia and revert to publishing under his original name. News from the Guardian that Barnes and Noble are up for sale. That and the demise of Borders in the UK are a warning that the big bookstores are dying as they are squeezed both by ebooks and the economies of scale possessed by online retailers. Back in 2007 I did a very simple analysis that showed it was often cheaper to buy books new in Australia than second hand from overseas. Well that was then, this is now. Suddenly it seems as if one's whole life is on replay. This time it's cloud storage. Definite deja vu. Back in 1988 we deployed Dec's PCSA (later known as pathworks). This was a bit of software that let you export a user's filestore on a VAX/VMS cluster to a pc as if it was remotely mounted disk on a server. you also could do the same thing using pc-nfs - or one of the other pc-client nfs implementations. (We did). PC-NFS had the advantage of not being tied to any vendor - we started off mounting filestore via SGI Irix boxes, moved to an mixture of Sun and Auspex - for home directory serving - and ended up with NetApp replacing the Auspex. The users probably didn't notice - or care very much as long as it stayed working. But then the world shrank. Everyone had a networked pc and running software locally replaced running applications in shared environments. So everyone had a copy of word, excel and the rest, ran them locally and just emailed documents around. The idea of shared directories kind of went away - I remember someone from Microsoft at the end of the nineties having trouble with the shared directory concept. At the time I thought 'How wierd'. I should have paid more attention - the meta story was that you could do it all with exchange and public folders (and later on with stuff like sharepoint). No (apparent) folders or filesystem. Stuff exists in a way that makes sense to you. Think collections, think repositories, think content/document management. And then laptops got really common. And if they were offsite they quite often didn't have a server connection - backup, synchronisation, automated application upgrades, just sort of died because they were just too hard. Everything comes down to logistics. So remote access to sharepoint, or your content management solution started becoming important. And then of course people started having multiple machines - one at work, one at home, a netbook for travelling, an iPad. And suddenly people started having the 'bugger, it's on my other machine' moment. And we started seeing solutions like 'Go to my PC', and rather more cleverly Dropbox with it's shared storage and sychronisation. Clever because it not only provides remote storage but local copies for when you can't get a network connection, or indeed if the DropBox server goes down, and having two copies measn that you have a backup. Likewise, Google Docs, Gmail and the like mean that you can access your email and documents from whereever there's a browser, again divorcing you from the need to have your files on that machine and to have that machine with you. Likewise the Gladinet cloud desktop give you a way of accessing cloud storage where you have machine specific mounts. and cloud compute just brings back the days of VMS batch jobs (well conceptually anyway). I recently received an emailed pdf from Google Incorporation (googleanniversary@google.co.uk) inviting me to apply for some funding. So, being a good corporate citizen I decided to report it as I reckoned that you'd like to know somone was ripping off your letterhead. This actually turns out to be extraordinarily difficult. Google have sites and fora for people doing misleading web pages and malicious emails using their services, but nowhere you can actually report that someone is doing naughty things impersonating them while using other people's services. Now Google is big company, and runs fairly lean and mean, and probably has a gazillion of support queries so you can understand that they really can't cope with email and push people to self help using the fora. But there are the difficult cases.